Internationally released as “Viceroy’s House”, this film gives us a glimpse of life during the tumultuous period before the emergence of India and Pakistan as independent nations in 1947. Based on two books and inspired from true events from her own family history, director Gurinder Chadha who is known for her film “Bend it Like Beckham”, gives us a semi-fictionalised period drama that takes place inside the magnificent Rashtrapati Bhavan which served as the Viceroy’s House during British India. The film begins with Lord Louis Mountbatten (Hugh Bonneville) arriving in Delhi along with his wife and daughter with the task of handing over the reins from the British imperials to the natives, but not before slicing it into two, based on religious beliefs. 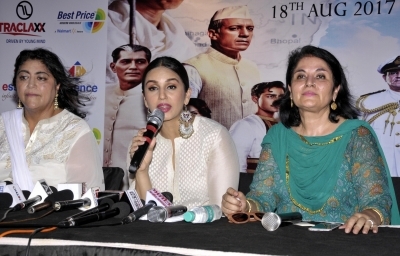 While the film captures how Mountbatten is torn between the warring Hindus and Muslims and is used as a pawn, by Winston Churchill, the then Prime Minister of Britain, it also unfurls the romance between Mountbatten’s valet Jeet (Manish Dayal), a Punjabi Hindu and Aalia (Huma Qureshi) a Muslim who works as a translator at the Viceroy’s House. The plot is straightforward as it reveals the intense and politically complex series of events that took place over a period of weeks. The harrowing details and unbelievable twists tactfully balances the emotional quotient without tilting the scales or losing key points of the chronicle. Hugh Bonneville as Mountbatten, Gillian Anderson as his wife Edwina Mountbatten, Neeraj Kabi as Gandhi, Tanveer Ghani as Nehru and Denzil Smith as Mohmammed Ali Jinnah play their roles exquisitely with a depth of sensual warmth and sincerity. Though they play their parts to perfection, they are presented as caricatures, lacking the charisma and charm of the real life characters. And this is the major issue that plagues this production. The others in supporting roles are realistic and natural. Manish Dayal as Jeet and Huma Qureshi as his reluctant love interest Aalia, are sincere and charming. Om Puri as Aalia’s blind father delivers a powerful performance which is evident especially when he is leaving India and realises that his daughter though betrothed to Asif (Arunodaya Singh) is in love with Jeet. Arunoday Singh as Jinnah’s driver Asif and Darshan Jariwala as a Supervisor at the Viceroy’s residence, are wasted in miniscule roles. If you dismiss comparing the main actors’ personalities with their performances, the film is astutely mounted. The direction largely quivers between natural and staged. The scope of the production design, though antiseptically prim, gives a fair picture of the era and the scenes especially in the transit camp are emotionally gripping. Overall, despite its shortcomings, “Partition: 1947” leaves a mark as an engrossing and imposing film.